Three crews from Chorley, Bamber Bridge and Leyland attended the incident which happened at around 4pm on 12 March at Barnside in Euxton. 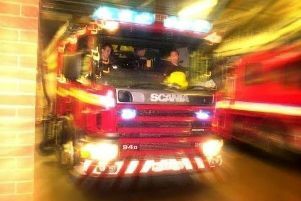 Firefighters were called to a blaze in a flat after neighbours spotted thick black smoke billowing out of a kitchen window. A spokesman for Lancashire Fire and Rescue said: "Neighbours were alerted by a sounding smoke detector, on investigation they saw the flat was full of smoke and called 999. Fire crews forced entry through the front door. "A small fire which was producing large quantities of acrid smoke was quickly extinguished in the lounge, the occupant had been out at the time of the fire. "The property suffered severe smoke damage and fire damage to a number of items in the lounge. "We believe the fire was started by smoking materials that were not correctly extinguished." "The fire was discovered by neighbours due to a sounding smoke detector, check your smoke detector regularly, for example on the 1st of every month. If you do not have a smoke detector call 08001691125 for advice. "Please ensure cigarettes and all smoking materials are safely extinguished when smoking in your home."